Handshake: Jobs, Internships, Employers, and More! What will you do with your Georgia College degree? Georgia College believes that career planning is a lifelong process and desires for all graduates to secure fulfilling careers post-graduation. Prior to graduation, undergraduate students are expected to complete a set of career planning benchmarks that follows a four-year career planning model. 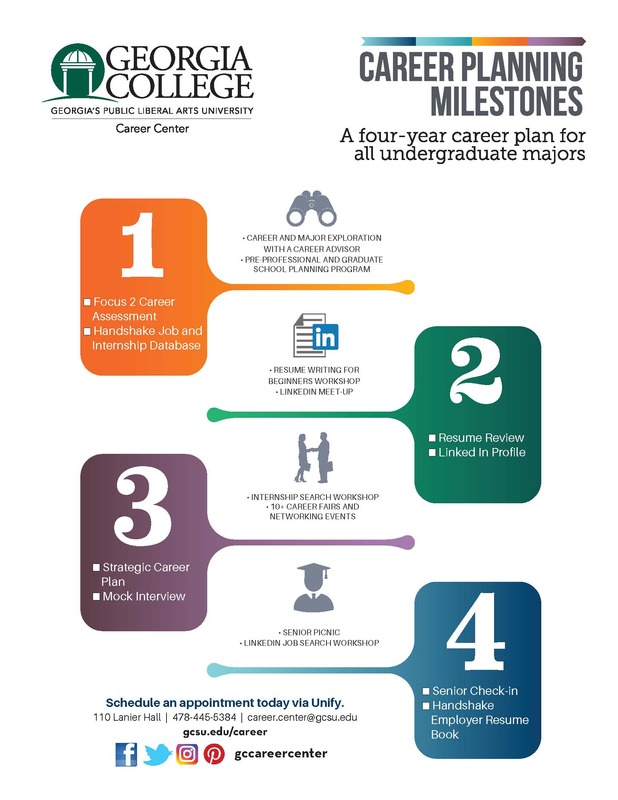 Known as the GC Career Planning Milestones, these benchmarks provide students an opportunity to engage in career development activities on an annual basis so that they are prepared for internships as well as transitions to a career or to graduate / professional school. For a complete overview of this expectation of all GC undergraduate students, please visit the catalog. Graduate students are not expected to complete the Milestones but should find the checklist helpful as well. We recommend that all students meet with a career advisor prior to graduation. Students are first introduced to the Career Center through their First-Year Academic Seminar course where students complete the Focus 2 Career Assessment and access their Handshake account to access internship and career programming information. Throughout their four years at GC, students can access the Career Center through individualized appointments, career fairs, meet-ups and workshops, class and student organization presentations, campus interviews, and much more.